If I'm going to make the world a better place, I'm going to start with cookies. We recently came into possession of about a dozen home-grown avocados - normally a very happy occasion but when confronted with so many that ripened all at the same time, of course, I've been struggling to find ways to use them that are deserving of their deliciousness. There has been a lot of guacamole happening around here, but at a certain point I knew I had to figure out how to bake with them. A while back I wrote about making chocolate chip cookies with avocados, and I experimented again with several variations this time around as well. The best combination? Replace 1/2 C of butter in my perfect chocolate chip cookie recipe with 1/2 C of mashed ripe avocado, and mix and freeze as usual. Bake frozen dough balls at 350F (instead of 375F) for 15 minutes. Voila! (Semi)healthy and extra tender chocolate chip cookies. I also had a hankering for a slice of a good quick bread (like banana, pumpkin or zucchini loaves), but wanted to see what could be done with avocados instead. Luckily I stumbled across this awesome recipe and with a few tweaks made a lovely loaf that is tender with a perfect crust, slightly sweet and has just a hint of warm fall spices. If you're hesitating to use avocado in baking, fear not! With these two recipes you'll wow your friends with your creativity and daring, and maybe unclog a few arteries in the process. Directions: Preheat oven to 350F and prepare a loaf pan with nonstick spray. Whisk together flours, baking powder, baking soda, salt, cinnamon and nutmeg and set aside. With a whisk or electric mixer, cream together avocados and sugar until well blended. Add oil and buttermilk and mix to combine. Add eggs and vanilla and mix to combine. Gradually add in dry ingredients and mix until just combined. Pour batter into loaf pan, then bake for 45-50 minutes until the top is golden brown and a toothpick in the center comes out clean. Remove from oven and let cool in the pan for 15 minutes, then finish cooling on a wire rack. Serve drizzled with honey, spread with butter, or even with jam! Keep the loaf in an airtight container at room temperature for a few days, or freeze for longer storage. I'm sure you know the story - girl goes to Costco, girl sees beautiful sweet red cherries, girl buys WAY too many. There's only one logical solution, and that's to find a glorious recipe to use them up! I love the drama of upside down cakes, but most recipes end up making a topping that's sticky sweet and overwhelms any other flavors in the cake. When I found this recipe (originally for apricots), I knew it was something special. The cornmeal and whole wheat pastry flour add some heft to the cake itself, but the result is still very moist and tender with the brightness of lemon. I cut the brown sugar in the topping down so the cherry flavor could shine through, so if you want something more intense you can double the amount. This is the perfect brunch or tea-time treat, not too sweet but showcasing flavors of whatever fruit you choose to include. What a lovely discovery! Directions: Preheat oven to 350 degrees. Grease one 8" cake pan with butter or nonstick cooking spray. Wash cherries, then cut them in half and pit them. Spread brown sugar evenly along bottom of cake pan. Place cherries cut side down in concentric circles on top of the sugar layer so the entire surface is covered. Whisk together flour, granulated sugar, cornmeal, baking powder, baking soda and salt in a large bowl. Whisk together buttermilk, eggs, butter, oil, vanilla and lemon zest in another small bowl. Add wet ingredients to dry, then fold gently together with a spatula until combined. Pour cake batter over the cherries in the pan, and use spatula to even out the surface. Bake for 30-35 minutes until top is lightly browned and a toothpick in the center comes out clean. Let the pan sit on a wire rack for 10 minutes before running a knife around the edge and turning the cake out onto the rack to cool completely. There are times when it's absolutely appropriate to spend a week making a complicated and multi-layer cake, and I decided that my 23rd birthday was one of those occasions. I love excuses to break out the expensive bottle of wine I've been saving, wear my favorite dress and get my best friends together to enjoy a beautiful day. This Lemon Ricotta Cake was my favorite treat when I worked at Extraordinary Desserts in San Diego, and I was excited to see it in Karen Krasne's Extraordinary Cakes cookbook. 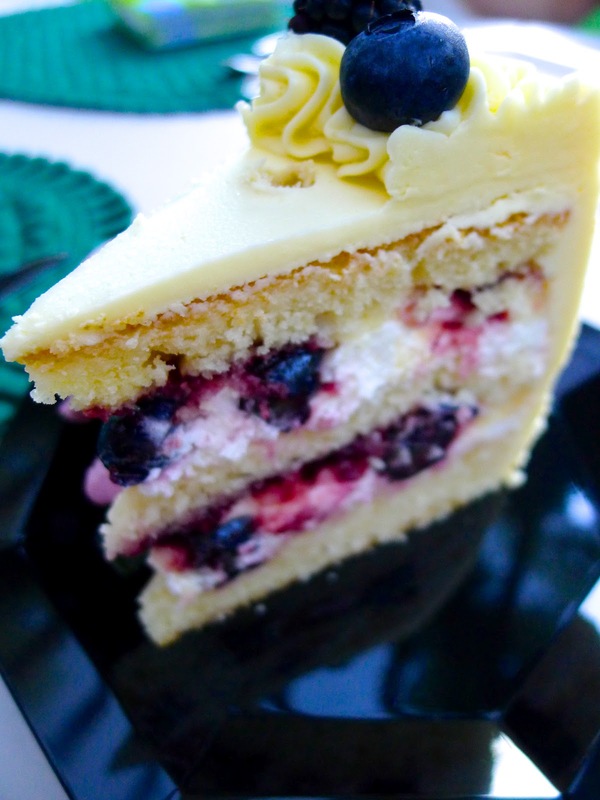 Ricotta cake is brushed with lemon simple syrup, then layered with lemon whipped cream, lemon curd and fresh blueberries and blackberries and topped off with lemon buttercream frosting. This dessert is pillowy and creamy with contrasting sweet and tart, the perfect way to celebrate a summer day. The recipe calls for making the lemon curd from scratch, but you could easily use store-bought. The hardest part of the recipe is orchestrating the many components and making sure they're ready at the right times during the assembly process. I won't even try to reprint the multi-page recipe here, but when you buy the book (because you should!) make sure you read through everything multiple times so you have the complete picture. Around these parts, there's a grocery store that's famous for good food. Bi-Rite Market is a neighborhood institution known for its carefully chosen, locally-made, organic foods of all kinds, and I always walk out with a smile on my face and something absolutely delicious in my bag. One of their awesome creations is particularly drool-worthy, though unassuming in its small plastic container, and seems to always work its way into my shopping basket. Chocolate Pot de Creme is somewhere between mousse, ganache and pudding and can be made into elegant individual desserts or saved for a late night pajama craving. Luckily for me (and you), Bi-Rite recently published a book called Eat Good Food, describing the best ways to shop, store and prepare your food, and it includes this recipe! The ingredients aren't complicated, but make sure that you get good quality chocolate - no Hershey's here! For budget shoppers I suggest Trader Joe's pound plus bars, or if you want to splurge pick up some Scharffen-Berger or Tcho. 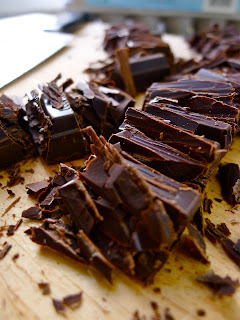 Dark chocolate (70-75%) will make a sinfully rich and deep flavor, while milk chocolate (60-65%) will be significantly lighter and more pudding-like. I used 4-oz canning jars, but you can use tea cups, small bowls, even martini glasses as the mood strikes you! And what's better to accompany your pot de creme than the light, buttery crunch of pistachio shortbread? They're the perfect sidekick with a contrasting texture and complementary flavor, and taste fantastic with your coffee the next morning. Elegant but simple, they're the best cookies I've made in a long time. Directions: Place chopped chocolate in a large heatproof bowl and set aside. Combine egg yolks and 3 Tbsp sugar in a medium bowl and whisk until smooth, then set aside. Combine cream, half and half and 3 Tbsp sugar in a medium saucepan and cook over medium-high heat, stirring occasionally until just before it simmers (small bubbles appear around the edge of the pan). Pour about a cup of the hot cream mixture into the egg yolks while whisking constantly, then pour yolk mixture back into the saucepan and whisk constantly until smooth. Put the pan back onto medium-high heat and cook, stirring constantly, for 2-3 minutes until the mixture has the texture of pureed soup. Pour cream mixture over chocolate and let sit for 3-5 minutes. Slowly and gently stir with a whisk until smooth, being careful not to incorporate air. Add vanilla and stir to blend. Pour mixture through a fine strainer into a measuring cup, then divide among containers. refrigerate, uncovered for 2 hours and then wrap tightly and refrigerate for at least another 4 hours before serving. Let the pots de creme sit at room temperature for 15 minutes before serving. To store longer, you can freeze the containers. Preheat oven to 325 degrees. Prepare a baking sheet with parchment. Slice logs into 1/4 inch thick pieces, re-rolling if necessary to reshape. Place on baking sheet about 1 inch apart and bake until lightly golden, about 18 minutes. The warmth and crunch of a graham cracker-pistachio crust is perfectly contrasted with the creamy cloud of light lemon cake dotted with pops of roasted blueberry, and topped with the crisp sweetness of fresh strawberries. Are you listening? There's only one possible color scheme for Fourth of July dessert. This year, I created a cheesecake that ranks among the best desserts I've ever made - and I can't wait to share it with you! My audience was rather skeptical about the lack of cream cheese ("How can it be cheesecake...?") but everyone was very impressed with the light, creamy texture of the finished product. I believe it's marginally healthier than the traditional recipe, but you should choose this cheesecake simply because it is FANTASTIC. 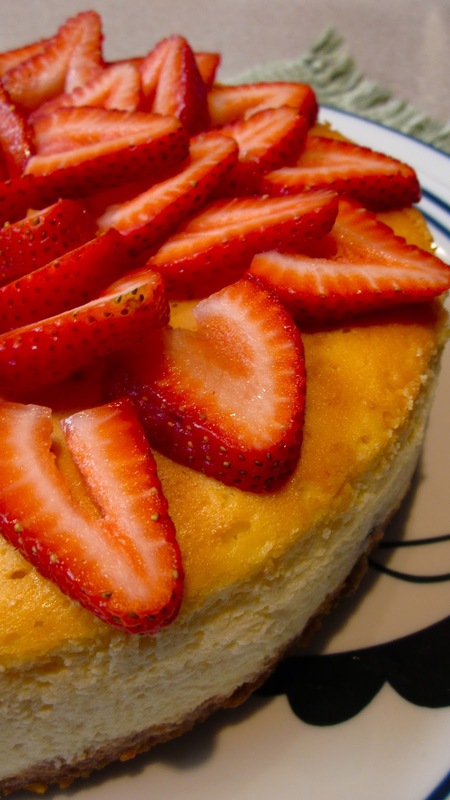 If you're not experienced with baking cheesecakes, all you need are the right tools and a few guiding principles. You definitely need a springform pan, with a detachable ring around the sides to allow full release of the cheesecake when it's cooled. Also make sure you have some heavy duty aluminum foil and a roasting pan for the water bath when you're baking it. The rest is... cake. Directions: Preheat oven to 375 degrees. 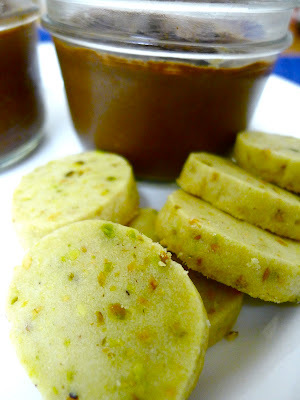 Pulse graham crackers and pistachios in a food processor until finely and evenly ground. Add sugar and pulse to combine. Add melted butter in small increments until mixture is moist and sticks together but doesn't ooze butter (you may not use all of the butter). Press crust into bottom of springform pan with your fingers to form an even layer. Bake for 7 minutes, remove and let cool completely. Directions: Preheat oven to 375 degrees. Spread blueberries onto baking sheet lined with foil, and roast for about 8-10 minutes until berries start to pop and release their juices. Remove from oven and set aside. With an electric mixer, blend together ricotta, mascarpone, greek yogurt until smooth. Add eggs one at a time, blending between. Add sugar, flour, lemon zest, lemon juice, vanilla and salt and combine completely. Wrap the cooled springform pan with heavy duty foil and place in roasting pan. Add water until the line reaches ~1/3 the height of the springform. Pour cheesecake mixture on top of cooled crust. Add roasted blueberries by small amounts on top, and swirl once or twice with a spoon to distribute them (they will sink to the bottom but leave some flavor throughout). Bake for 50-60 minutes, until the cake is set in the center (not liquid, but still jiggly). It will brown lightly on top, so cover the cake with foil after 30 minutes if you want to keep it light. When it's done, turn oven off and let the cake sit in the oven for 1 hour to set completely. Remove and let cool completely. Refrigerate for several hours or overnight before decorating and serving. To decorate, wash and hull strawberries and slice them lengthwise. Arrange along the circumference of the cake, starting with the outside edge and moving inwards. If you have extra strawberries, puree them in a food processor and serve the fresh sauce with the cheesecake! To be honest, when I picked out this recipe I didn't expect to find the best of anything! It was a late night after a long day at work, but I wanted to bring a treat to work the next morning as a thank you to my fantastic mentors/coworkers for this past month at my clinical internship. There are fresh blueberries galore in the house, and they clearly had to make a cameo in whatever I put together. Scones are one of the most delicious additions to breakfast or afternoon coffee, and I've played around with a lot of different recipes and techniques with varied success. But of any of those, this recipe is by far the easiest and most delicious! Light and buttery crumb with a golden edge, balanced with sweet bursts of berries, you won't be able to stop at one. Lucky for you, they're easy enough to whip up any night of the week! Note: I decided to make these as "drop scones," meaning you don't have to roll them out and cut them - just drop the dough onto the baking sheet! It's a bit of extra work and a lot more flour all over the kitchen to follow the original recipe, but if you're not one for shortcuts I'm sure it would be just as delicious. Directions: Preheat oven to 400 degrees. Line a baking sheet with parchment paper. Whisk together flour, sugar, baking powder and salt. Blend butter into flour mixture using pastry cutter or forks, until the mixture looks like coarse crumbs. Gently fold in blueberries. Add beaten egg, vanilla and milk and gently mix until just blended. 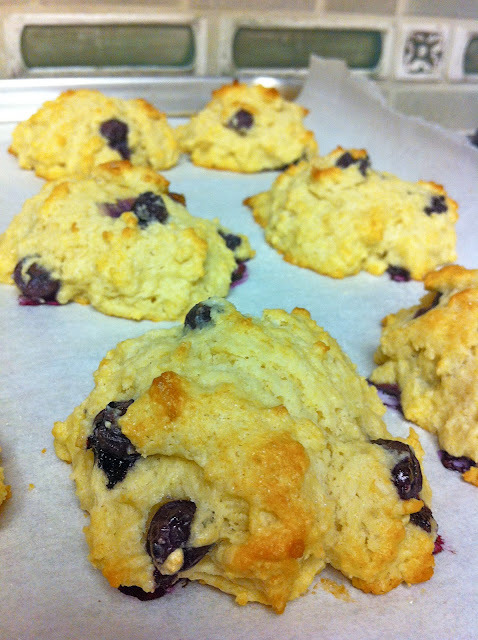 Drop about 1/3 C of dough for each scone spaced evenly on the prepared baking sheet. Sprinkle turbinado sugar on top of each scone if desired. Bake for 18-22 minutes, or until scones are just golden. Let cool before enjoying. There's no better way to celebrate the return of summer than with a Memorial Day BBQ. After debating what to contribute to the feast, I realized there was only one solution - strawberry cupcakes! 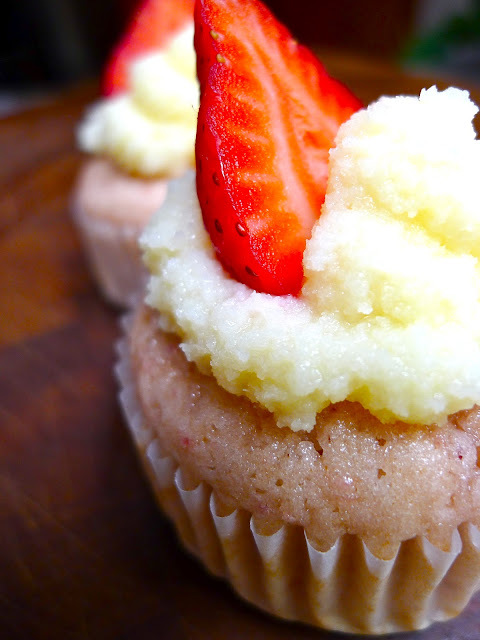 Most of the cupcake recipes out there are kind of lame, only adding chunks of strawberries to vanilla cake batter. I knew that nothing short of beautiful, uniformly pink cakes would make the cut, so I was overjoyed when I stumbled across this recipe for Sprinkles strawberry cupcakes. They're a gorgeous light pink color, wonderfully tender and offer the perfect amount of sweetness and strawberry flavor. Topped with a slice of fresh strawberry, they're beautiful little additions to a dessert table. Don't miss your chance to put that fresh farmers market fruit to good use this June! I experimented with a vanilla mascarpone frosting, but didn't love the result, so I won't post the recipe here. But in the future, I would top these with whipped cream or even a light vanilla cream cheese frosting. The sky's the limit! But don't overwhelm the strawberry flavor with a topping that's more intense than vanilla. Directions: Preheat oven to 350 degrees and prepare cupcake tin with liners. Puree strawberries in a food processor, and set aside 1/3 C to use in the recipe. In one bowl, whisk together flour, baking powder and salt. In another, whisk together milk, vanilla and strawberry puree. Cream butter with an electric mixer until light and fluffy, then add sugar and beat until well-combined. Slowly add egg and egg whites and mix until blended. At low speed, slowly mix in half of the flour mixture. Add milk mixture. Slowly add the last half of the flour and beat until just blended, scraping down sides of the bowl as needed. Divide batter among cupcake liners and bake until the tops of the cakes spring back to light touch, about 20-25 minutes. Let cupcakes cool completely before frosting. Exploring the city, earning my doctorate in physical therapy, sometimes sleeping and always baking! Life is a little crazy but always good - one of the things that make it all worth it is playing in my kitchen and sharing the results with the people I love.